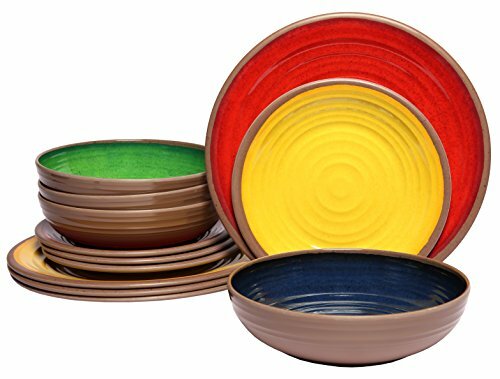 GREAT EVERYDAY DINNER SET: This 12-piece rustic melamine dinnerware set comes with (4) 11" dinner plates, (4) 8.5" salad plates, and (4) 32 oz bowls that are great for both indoor and outdoor use. The break-resistant design makes this a nice kids' melamine dinnerware set and also makes it ideal for camping or for use in RVs and trailers. CONVENIENTLY DISHWASHER SAFE: While low quality melamine plates & bowls can't be cleaned in the dishwasher, this premium 100% melamine dinnerware is uniquely dishwasher-safe to make clean-up a hassle-free affair. We've complemented the ease of maintenance with a BPA-free design to keep you and your family that much safer as you dine (not for use in the microwave or oven). ALL ABOUT CHARACTER: Give your chow some charm with our melamine rustic dinnerware set. Our clay collection combines an eye-catching charming look with vintage colors and a nice modern shapes to accentuate any setting with a heavy serving of character. Get a set for yourself and another as a gift for that someone with a taste for the unique.